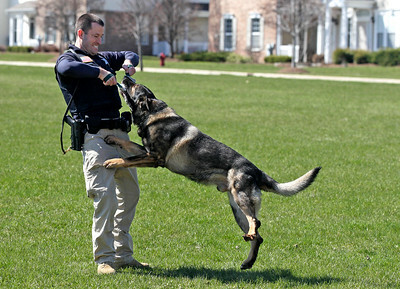 H. Rick Bamman - hbamman@shawmedia.com McHenry County Sheriff's K9 Deputy Paul Cosman rewards his partner Rocky with reward play on Tuesday, April 12, 2016 Rocky has been with the department 7 years. There is a bill in Illinois that would give K-9 officers the option to keep their retired partners. Right now, most of these decisions are left up to the respective sheriff's or police department on whether or not the K-9 is allowed to stay with its owner when the officer retires. H. Rick Bamman - hbamman@shawmedia.com McHenry County Sheriff's K9 Deputies Paul Cosman and Rocky take a break from training on Tuesday, April 12, 2016 Rocky has been with the department 7 years. 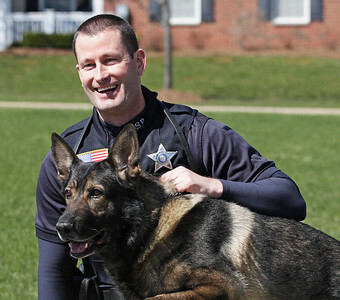 There is a bill in Illinois that would give K-9 officers the option to keep their retired partners. Right now, most of these decisions are left up to the respective sheriff's or police department on whether or not the K-9 is allowed to stay with its owner when the officer retires. McHenry County Sheriff's K9 Deputy Paul Cosman rewards his partner Rocky with reward play on Tuesday, April 12, 2016 Rocky has been with the department 7 years. There is a bill in Illinois that would give K-9 officers the option to keep their retired partners. Right now, most of these decisions are left up to the respective sheriff's or police department on whether or not the K-9 is allowed to stay with its owner when the officer retires.